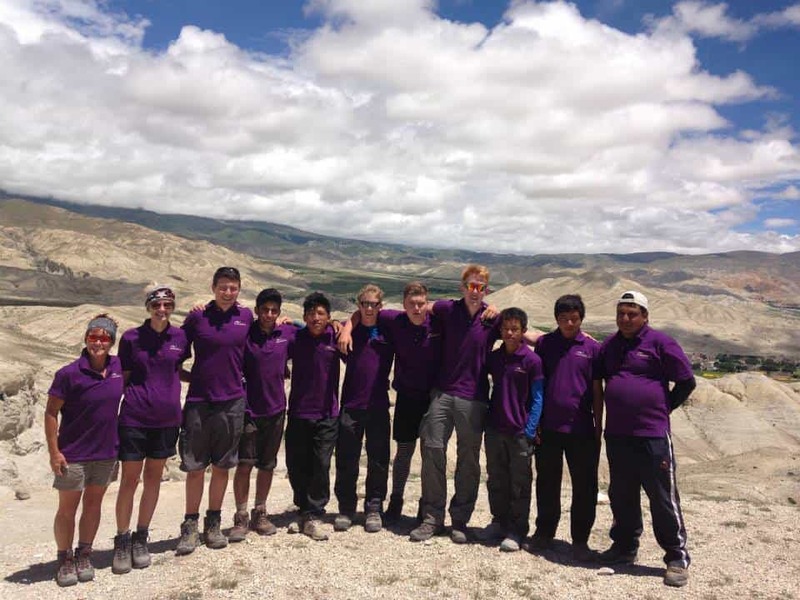 Enjoy our 15 days Upper Mustang trek with our supper friendly guides and support team. 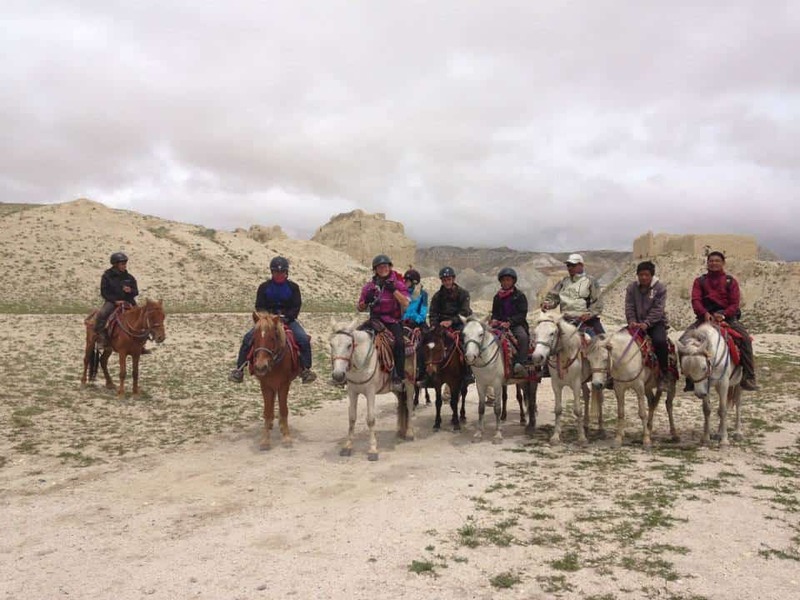 As per our Upper Mustang trek itinerary, day 01 will be your arrival day in Kathmandu and day 15 will be your departure day after the end of the Upper Mustang Trek. During your stay in Kathmandu you will be accommodated at newly built hotel “Kathmandu Suite Home” and locally owned guest houses will be provided during the Upper Mustang Trek. 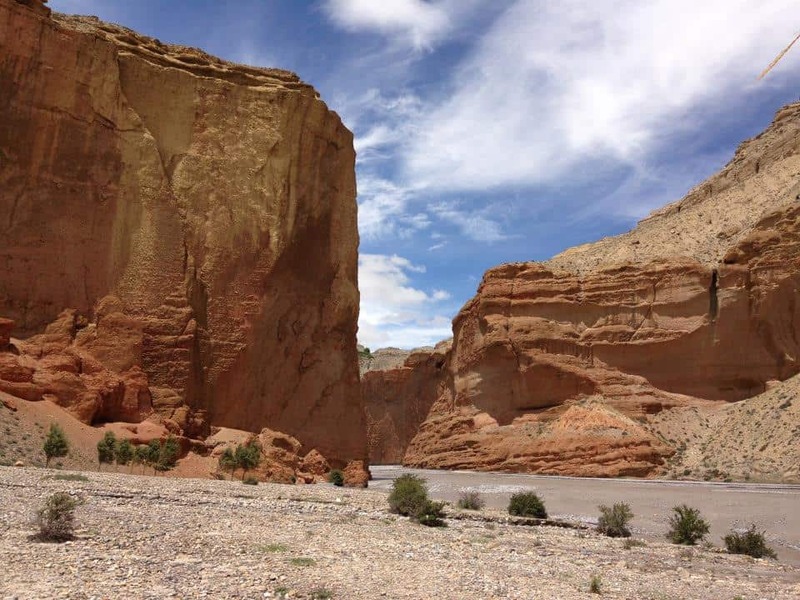 All travel logistics including special trek permit for Upper Mustang trek is included in the trek package. For any pre-booking trek information, contact at sales@nepalhiking.com. 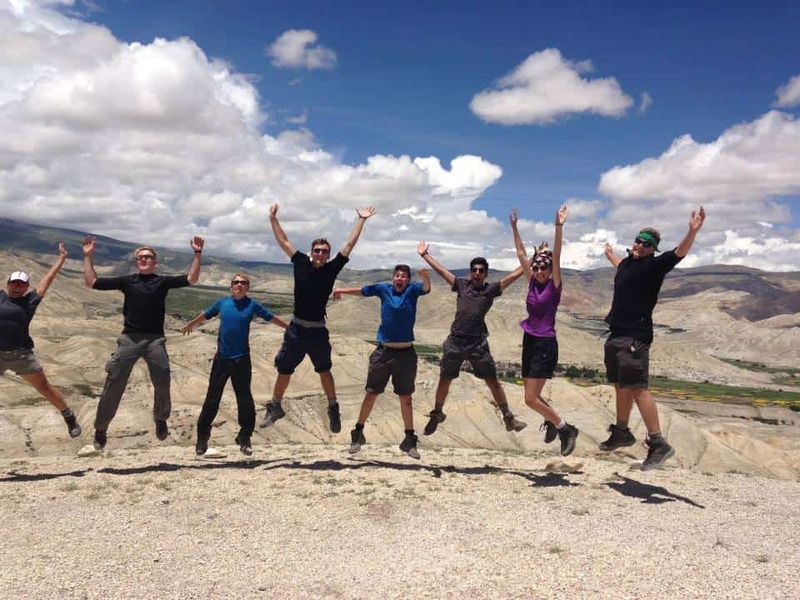 Why Upper Mustang Trek is Restricted? >Tibet, the border to the north. >>Many special management zones due to globally threatened flora and fauna. >>Unique mode of settlement with several old monasteries, ancient walled city and reserved caves. Until recent years, this Tran- Himalayan region was closed for foreigners. Nesting on the Tibetan boarder, the Mustang region is dominated by giants Annapurna and Dhaulagiri massif. Situated at the head of the Kali Gandaki in north central Nepal, the little-known district of Mustang is naturally and culturally attractive, in particular, origin of Tibet. 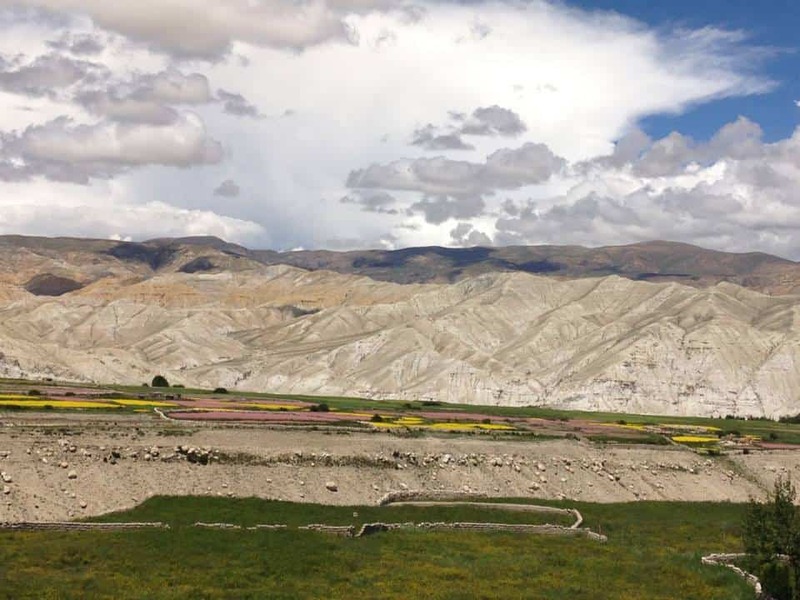 Tourists in Upper Mustang can opt for the strangely eroded landscape of this remote territory that presents a vibrant mosaic of earth colors- red, yellows, browns and blues. This location is bestowed with ecological diversities, delightful views of snowy peaks, colorful village, monasteries, ancient palaces. 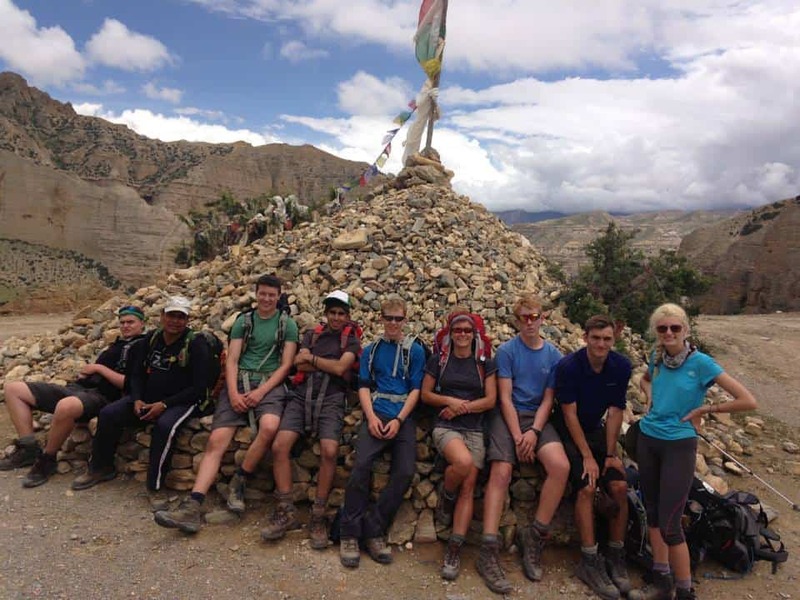 Enjoy your first Upper Mustang trek! An experienced guide along with a support porter (1 shared porter for 2 members) are provided during the trek. All requisite arrangement of permits, flight and hotel booking are included the trip package. Your arrival to Tribhuwan International Airport (TIA), Kathmandu (1350m); you will be warmly welcomed by our Airport Representative, and transferred to hotel (20 – 30 minutes drive). Overnight at hotel. B.B. Final preparation of the trek including arrangement of permits. Leisure day or you may also do a city tour of Kathmandu, Bhaktapur or Patan (optional tour in extra cost). Overnight at hotel. B.B. Drive from Kathmandu to Pokhara (900m). It’s 200 k.m to Pokhara, a 5 – 6 hours scenic drive through Prithivi Highway following the river bank of Trishuli and Marshyandi. On the way, we will have an opportunity to view the Himalayan ranges of Ganesh Himal, Manaslu and Annapurna (depends on weather). And the beauty of nature is just of awesome. Overnight at hotel near the bank of Fewa Lake. B.B. Day 4Flight Pokhara - Jomsom (2720m), and trek to Kagbeni (2810m, 2 hours walking). Flight Pokhara – Jomsom (2720m), and trek to Kagbeni (2810m, 2 hours walking). It’s just a 20 minutes short flight; but amazing flight through the Kaligandaki river gorge; the deepest natural river gorge in the world; which lies between two 8000m gaints peaks, Annapurna I (8091m) & Dhaulagiri (8167m). After landing at Jomsom airport; we walk following the east bank of Kaligandaki river to Ekle Bhatti (2740m, 1:30 hours). Then walk for another 30 mintutes to reach Kagbeni, an oasis-like settlement of flat-roofed houses. There is also a Tibetan Buddhist gompa of Sakyapa sect in the village and views of the gompa with Mt. Nilgiri, Mt. Tilicho, Mt. Dhaulagiri and Mt. Annapurna rising above are superb! Overnight at hotel. B.B. After breakfast, we take a short walk through a narrow flagstone-paved path, then we enter to the restricated area of Mustang. From here, we continue our walking to east bank of Kaligandaki river. We walk through the impressive village of Tangbe (3060m), Chhusang (2980m) & Chele (3050m) overlooking the fantastic landscapes. There is a small, but impressive cave gompa in Chhusang which is dedicated to White Tara, the buddha of Success and Achievement. After 45 minutes continue walking to Chele; we can see the good view of back down the Kaligandaki valley, with the peaks of Tilicho and Nilgiri. After another 11/2 hours slow pace walking we arrive at the Dajori La Pass (3735m) with views down the valley. After another 30 minutes walking we arrive at Samar, a small picturesque village. Overnight at Guest house. B.L.D. We walk through the center of the village and descend to a stream where we can see eroded watercourse; then we climb up and continue up towards the Bhena La (3838m) and Yamda La (3860m). 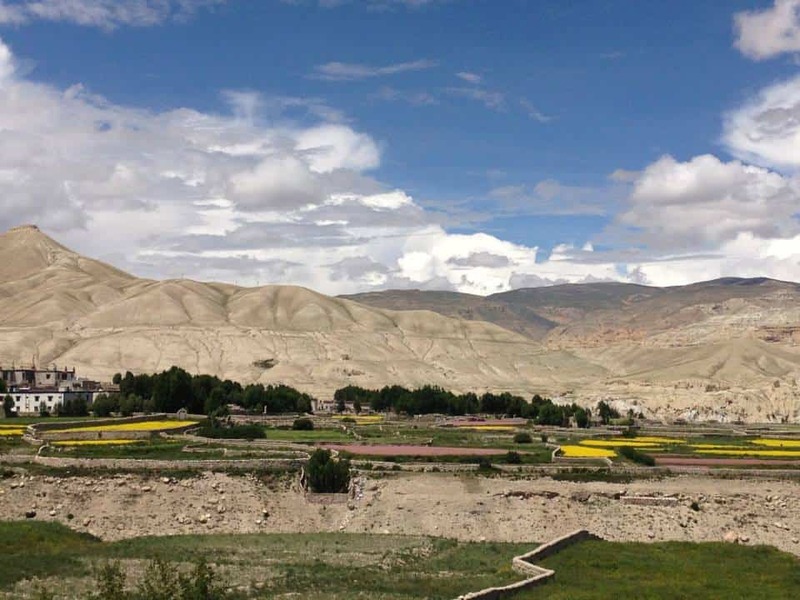 From here we can see our first substantial views of Upper Mustang with coffee-colored hills nearby; then we walk to Syangboche village (3800m) following mani walls and stupas; then eventually we arrive at the village of Geling. There are 2 gompas in the village, the date back to 15th century which are worth visiting. Overnight at Guest house. B.L.D. Today we climb a steep uphill just above the 2 gompas and continue walking to a pass (4025m) from where we can enjoy overlooking back towards the Annapurnas. Then we trek down to Ghemi (3520m), a small settlement of few tea houses, then continue trek down to a stream and cross a suspension bridge and ascend the upper valley where we can see the longest mani wall in Mustang region. Following the trail beside the mani wall, we climb up another pass of Tsarang La (3870m); and we descend to Tsarang, the old capital of Mustang. Overnight at Guest house. B.L.D. Day 8Trek to Lo - Manthang (3809m, 4 hours walking). 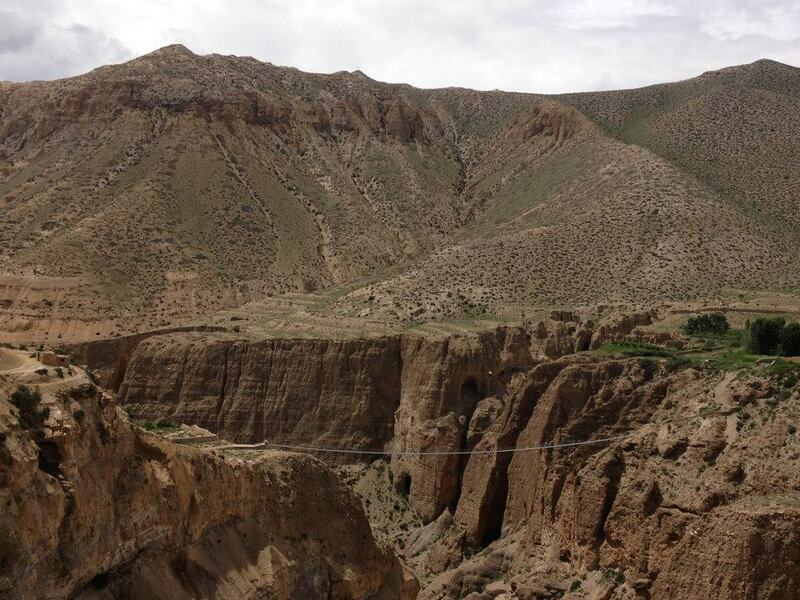 Today is the final day of our destination, short and moderate walking to Lo – Manthang, the medieval walled city. We walk following the Tsarang river to the north and gradually climb up to the Lo La (3950m) from here we can see the good views of Lo – Manthang and northern Mustang. 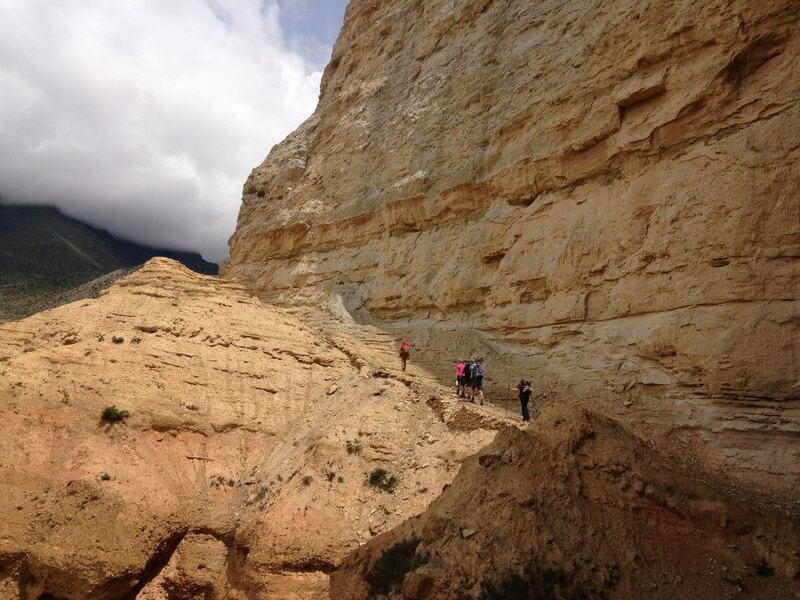 From the pass, it is an easy down hill walk to ancient walled capital of Lo- Manthang. Overnight at Guest house. B.L.D. After breakfast, we go for walking tour around the valley. There are four major gompas which are worth visiting: Jampa Lhakhang or Jampa Gompa, the oldest, built in the early 15th century and also known as the “God house”; Thubchen Gompa, a huge, red assembly hall and gompa built in the late 15th century and located just southwest of Jampa Gompa; Chodey Gompa, now the main city gompa; and the Choprang Gompa, which is known as the “New Gompa”. Overnight at Guest house. B.L.D. Trek to Ghemi 93520m, 5 – 6 hours walking). Overnight at Guest house. B.L.D. Trek to Samar (3660m, 6 – 7 hours). Overnight at Guest house. B.L.D. 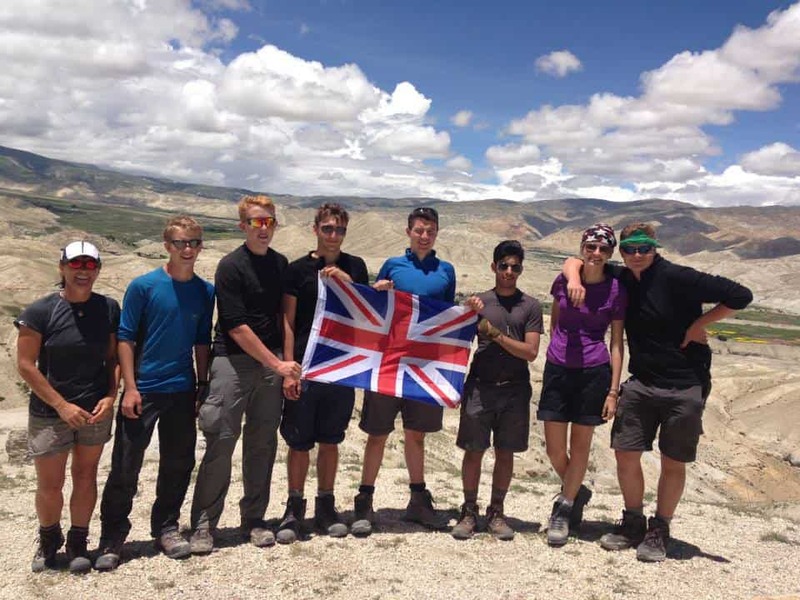 Trek to Jomsom (6 – 7 hours walking). Overnight at Guest house. B.L.D. Flight from Jomsom to Pokhara early in the morning. Overnight at hotel. B.L.D. Drive back to Kathmandu (200 k.m, 6 hours drive). Overnight at hotel. B.B. I am really happy to travel with your company. This is third time (Helambu circuit, Himalayas crossing by jeeps and Upper Mustang). We have very professional and friendly guides. Cook who prepare very delicious food. All staff is polite and friendly. Sometime I ask about changes in program and your company help me do the best as quickly as possible. I never forget how Tilak helped us with helicopter rescue of our daughter from mountains. She was really ill with high fewer. We were short of money and only thanks to Tilak all this helicopter operation was done. I don’t know what more you need to improve. As for me – you are perfect company and I don’t want to travel with another one. 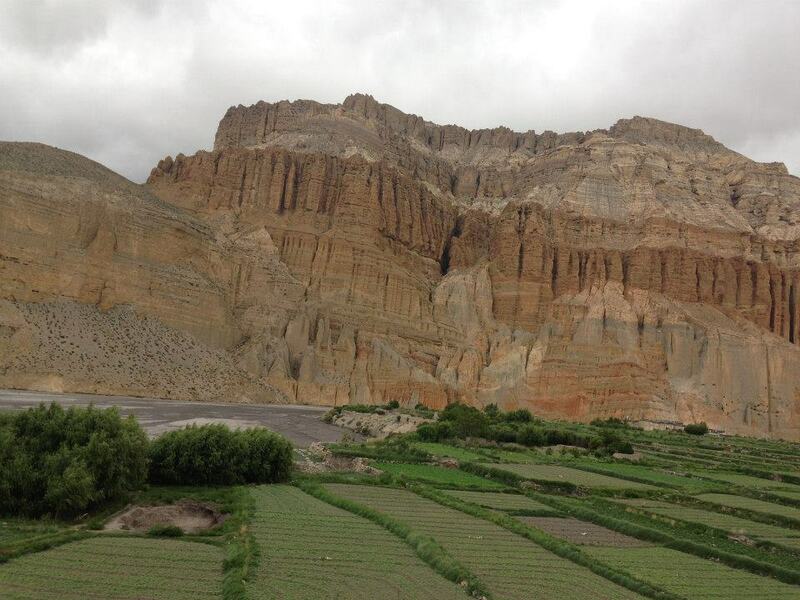 My trek to Lo – Mangthang (Upper Mustang) was spectacular. All of the people I met in the hotels, along the trekking path, etc. are extremely friendly and helpful of course. The landscape is the wonderful. Ram, my guide and Bikul, my porter were absolutely helpful. Ram, profanely taught me a lot of Nepali of practical use. We became like a little family because the group size was so small.